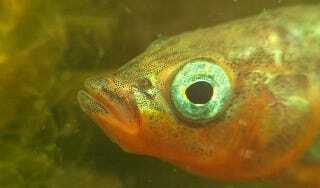 This is the stickleback. The males of the species have a reputation for being wonderful fathers. They are so baby-crazy that if their nests are empty they will steal the eggs of other males, just to get a little something to watch over. But, wait! Just how did their nests become empty in the first place? It’s odd that the fish stealing eggs wouldn’t have mates already. Stickleback females choose their mates by color and health. Males that have managed to turn a beautiful scarlet color while remaining robust are sought-after. Egg-stealers usually look so good and seem so energetic, what could have happened to make their nests empty? And where could they have gotten the protein to become so beautiful? If an idea is beginning to dawn on you, don’t feel too clever. It dawned on the female sticklebacks first. Male sticklebacks whose initial matings have left them with a small clutch of eggs sometimes cut their losses (and all the energy they would have to spend on rearing the small group of offspring) and eat all of their potential children. The eggs give them the color and vigor to attract a better mate—one who will fill their nest with eggs. Females have gotten wise to this, which is why males with empty nests will try to steal a few eggs from other males. That way they can eat their babies, and still look like the kind of guy who would never do that kind of thing. Now, even innocent males will try to grab a few eggs, just to keep from looking like ovicidal maniacs.